Construction of the main elements of the Flood Protection Barrierstarted in 1981, but the project was fully implemented only in 2010. 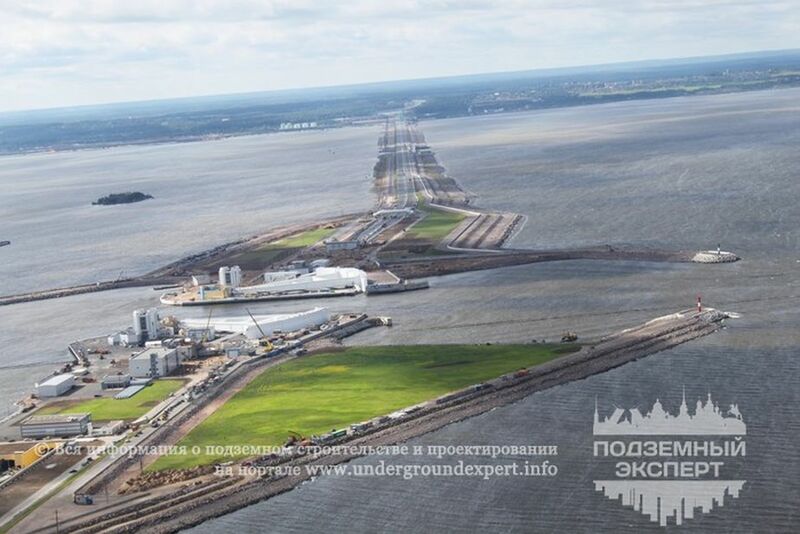 The barrier secures the flood protection with extreme high water being 4.55m, top level of the storm wall at the sea level datum— 7.5 m. Barrier include two navigation structures (С-1 and С-2), 6 water sluices (В-1 – В-6), 11 dams (Д-1 – Д-11), the road constructed on the embankments dams with a tunnel, bridges and crossings, motorway, approach channels. 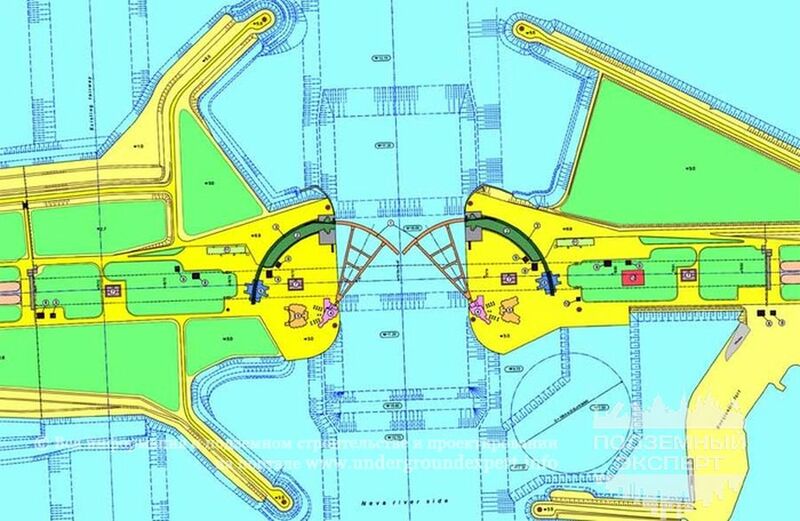 In October, 2008 the principal marine route of Saint Petersburg, navigation structure С-1 was ready for operation. One month later the temporary route that was in use during C-1 construction was filled in. 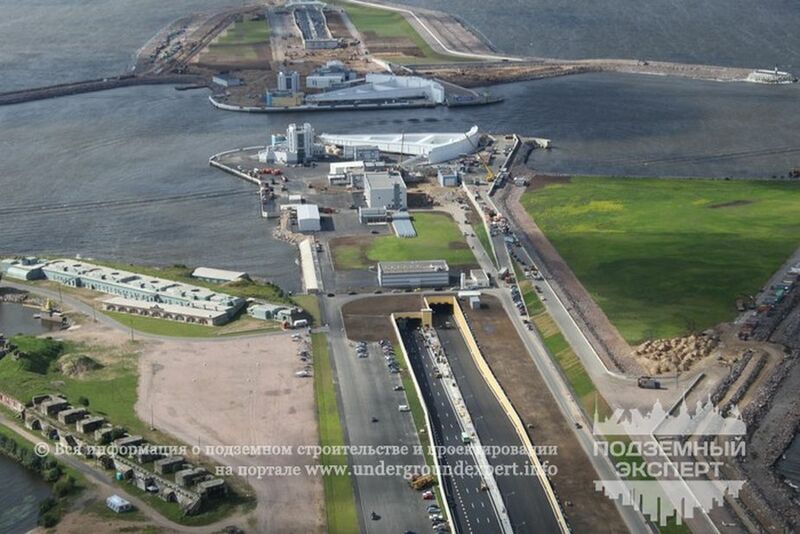 Right after construction of six-lane motorway started, including the tunnel, which is 1,961 m long, 43 m wide and with the deepest section at the level of 28 m. It is a part of the navigation structure С-1, that is, in turn, a part of Flood Protection Barrier, a complex hydro-engineering facility. The tunnel has two main tubes. Each tube carries three-lane motorway (each tube is 15.25 m wide). One more tube (in the center) is designed for maintenance systems and evacuation. Besides, on the outer side there are two cable galleries. The length of the underground section is 1,189 m, the two ramp sections are 386 m long and the two change-over areas are each 30 m long. State-of-art technologies were implemented during construction, including new method of waterproofing with the use of PVC-membrane in particular. 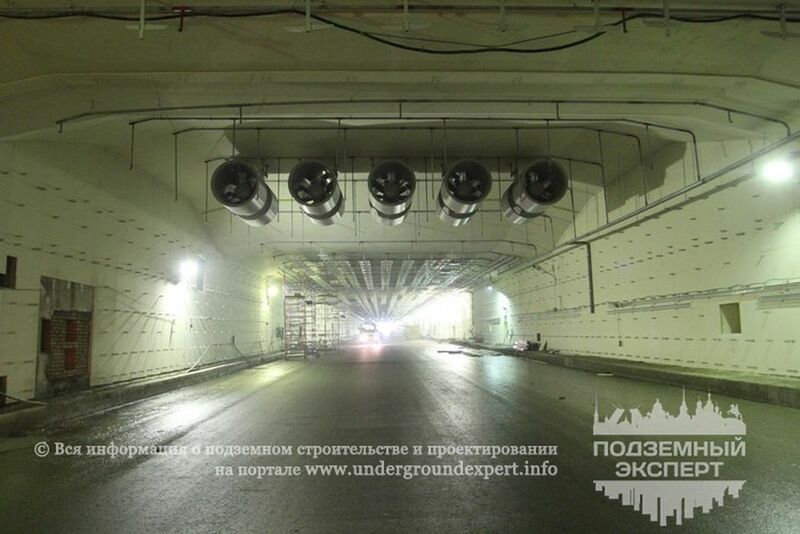 Engineering networks for the tunnel operationanswers the highest world standards. The key feature of the south part construction is in bedding being not soil, but mat on the pile foundation. The superstructure of South part (717 m long) is made of sections. It includes 9 ramp, 2 portal, 9 tunnel sections, jointed each 30-40 m. Joint is a sandwich panel, consisting of two asbestos-cement-sheets, with plastic foam in between. Then special rubber and waterproofing are added. At the last stage the joint is concreted. Such a structure, thanks to deformation capacity, balances appearing strains and helps to secure structural integrity of the tunnel.